What I Think Is What I Write, What I Write Is What I Love. Why I Write This Blog ? 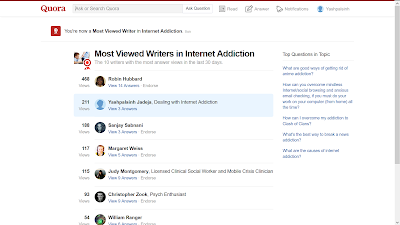 With just a span of few months and with just 3 answers, I'm one of the Most Viewed Writer on Quora for Internet Addiction. 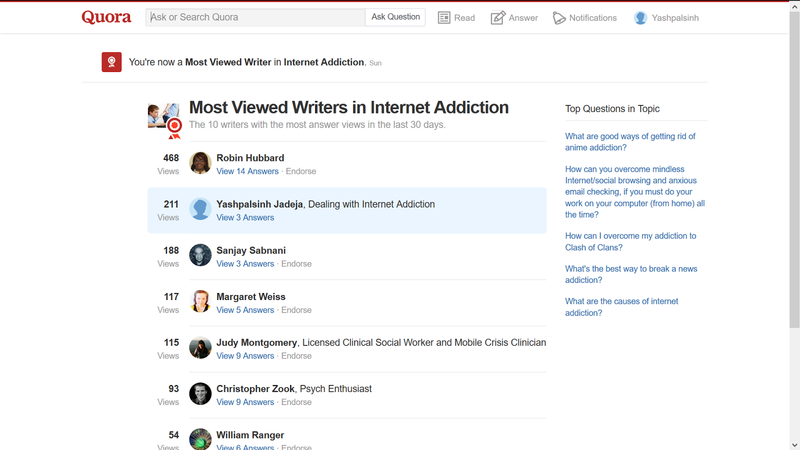 Link of my quora answers for Internet Addiction. Assume that you're on the verge of dying. You've probably a few months to live. You're suffering from some notorious form of cancer wherein you've very less hope of surviving. And then you think that you've very less time for all the things you wanted to do, for all the things you wanted to say to your loved ones, to your children and to the world. How would you want your children to remember you? Of what you thought about them? Your feelings for them? A few days ago I read the book - The last lecture by Randy Pausch. Randy was a professor at Carnegie Melon University and the book and the lecture is about achieving your childhood dreams. But more than that, I found the book as a good resource on parenting. 1. If I were a painter, I would have painted for them. If I were a musician, I would have composed music. But I am a lecturer. So I lectured. For the past couple of days I have been reading on Productivity Tips. Have been scouring various blogs on the same. One thing that has caught my fancy is Digital Detox. To stay away from all kinds of Electronic Connecting Devices, especially Smart Phone. I am constantly connected to the Internet via my iPhone. Even while working on stuff that doesn't require me to be connected to the Internet, I keep my WiFi on. And this in turn compels me to check my email or browse unnecessary stuff on the Internet. This disrupts my thinking process or my work. Although I love being connected to my friends and family members over Whatsapp and other social networks, I don't want it to be a habit where I check my phone even if there are no new notifications. Off lately I’ve been constantly thinking and reading about self-development. A topic that I’d read for years while in school and college, but then I totally forgot about it. A few blogs that I read, my own life, and the random thoughts that strike my mind enforced me to think about my own development. I observed that I was so engrossed in the outer world. I had forgotten to talk to myself. To think about me. These days we all are so busy with our mobile phones and the “notification world”, be it email, blogs, twitter, facebook, Instagram, etc., that we’ve totally forgotten our own world. A world where we can be alone and at peace. Mobile phones have distracted human beings a lot. I can’t comment on all of them, to what extent they are distracted, and whether everyone feels the same or not. We are constantly distracted by notifications. This constant supply of information in the form of Social Media, News, Blogs or Whatsapp is continuously depleting our concentration.